Why Do People Use Blueberry? Oral preparations of Vaccinium mortinia (Blueberry), like blueberry powder, are used for the treatment of glaucoma and cataracts, urinary tract infections (UTIs), ulcers, chronic fatigue syndrome (CFS), multiple sclerosis (MS), varicose veins, fever, improving circulation, hemorrhoids and as a laxative. It is also used for colic, as a tonic after miscarriage and relief from labor pain. The dried leaves and fruit are utilized for diarrhea. Dried leaves are used to make tea in order to treat sore throat and other inflammations of the mucous of mouth or membranes of the throat. Blueberry juice is also utilized as a contrast agent in magnetic resonance imaging (MRI). By Inhalation - Fumes of burning dried blueberry flowers are used as inhaler for the treatment of insanity. Likely Safe - Oral and appropriate consumption of blueberry is thought to be safe. Blueberry seems to be safe when utilized in amounts commonly found in foods. To rate the safety of topical utilization of blueberry leaves, there is scarce and unreliable information available. Likely Safe in Pregnancy and Lactation - Oral usage of blueberry powder is considered safe if used in amounts commonly found in foods. Still avoid using. To rate the effectiveness of blueberry powder, there is scarce and unreliable information available. The most effective parts of Vaccinium mortinia are the leaves and fruit. There is high content of vitamin C and fiber in Blueberry fruit. It also contains flavonols such as kaempferol, quercetin ellagitannins, phenolic acids, catechins and the polyphenolic compound resveratrol. Other constituents include chlorogenic acid, beta-carotene, alpha-tocopherol and glutathione. Blueberries further contain proanthocyanidins and anthocyanidins, which have antioxidant effects. More than 25 anthocyanidins have been identified in blueberry fruit. 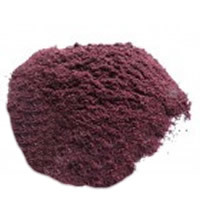 But the anthocyanidins in whole blueberry preparations do not seems to be well absorbed. Raw form of blueberry fruit may also consist of higher concentration of some constituents, when compared to cooked blueberries. Continuous heating of blueberries for 18 minutes at 190°C may lead to decrease in resveratrol content up to 17% to 46% due to degradation. Antioxidant in blueberry powder may also help against cancer and aging. Ethyl acetate extracts of blueberry fruit may prevent from ornithine decarboxylase that is an essential enzyme in tumor progression. Cranberry and Blueberry belongs to same family that seems to protect from bacterial adhesion to the bacterial and bladder colonization. What Are The Side Effects /Adverse Reactions of Blueberry? There is no lethal side effect reported due to oral or topical usage of blueberry powder. How Blueberry Interacts With Other Herbs and Supplements? How Blueberry Interacts With Drugs? Antidiabetes Drugs - Interaction rating between Vaccinium mortinia and anti-diabetic drugs is minor, still be careful about this mixture. Blueberry leaves may lower blood glucose, but this impact has not been reported in majority human beings. Until more confirmations, lab results of blueberry taking diabetic patient should be monitored closely. How Blueberry Interacts With Foods? How Blueberry Interacts With Lab Tests? Blood Glucose - Blueberry leaves may result in decrease in blood glucose and related test results, but this reaction has not yet been reported in human being. Magnetic Resonance Imaging (MRI) - Due to high amount of manganese in blueberry juice, it may play its role as a negative contrast agent in MRI of the gastrointestinal tract. Triglycerides - Leaves of blueberry, which is a productive part of bilberry, may result in lowering serum triglycerides and related test results but this impact of blueberry leaves has not yet been reported in human being. How Blueberry Interacts With Diseases and Conditions? Diabetes - Leaves of blueberry may reduce the blood glucose, but this activity has not yet been reported in human being. Till more confirmation are gathered, blood glucose level of diabetic suffering patients should be monitored carefully. Surgery - Blueberry may influence the level of blood glucose in individuals. Blueberry may affect the blood glucose control after and during surgical procedures. Patients taking blueberry should stop using it minimum two weeks before their suggested surgical activities. What Should Be the Dose/Administration of Blueberry? There is no typical dosage available for blueberry. Generally people mix bilberry and blueberry. Blueberry in the United States refers to the species of Vaccinium listed in this monograph. But in other parts of world, blueberry maybe related to the Vaccinium myrtillus, European plant which is called bilberry in the United States.